a world of color. makes my heart happy. glowing green, originally uploaded by ordinarymoment. I love when mistakes turn out awesomely. This was taken a while ago at the Elkhorn flea market, very shortly after I got my new camera. 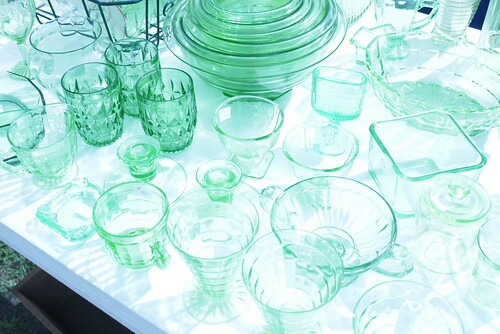 My white balance was on the wrong setting, so the sea of green glass ended up fading away into faint outlines. Can I just say that I adore when objects are grouped into like colors, monochromatic style. Love when they do this at flea markets and antique stores. Love when they do this at thrift shops. Color just draws me in and makes me so happy. It’s a simple fact of life but when you take the extra time to notice all the delicate and bold and gorgeous shades around you, you may just feel like your day got a little better. Oh color. You have quite the place in my heart.